How can we ensure our strategy will succeed, especially in changing and uncertain times? The answer, as explained in Strategy Mapping for Learning Organizations, is to become a more responsive organization - one that captures its strategy in strategy maps, learns from that strategy and can adapt to deliver results. For anyone involved in managing strategy and performance, applying the powerful strategy mapping techniques will move your balanced scorecard from an operational tool to one of strategy and change. It will help you capture, communicate and manage your strategy more effectively. However, strategy can no longer be simply a top down, annual process. It needs to be more iterative, emergent and involving. Many agile organizations have adopted rolling plans and budgets. To bring greater agility into the wider strategy and performance management processes requires the tools and techniques described in Strategy Mapping for Learning Organizations. 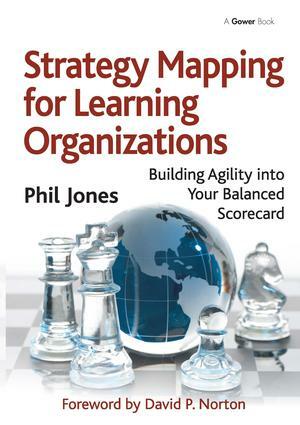 Phil Jones provides a detailed guide to developing, rolling out and managing with modern strategy maps and scorecards, building in agility and learning. His book incorporates the latest strategic thinking and models. It places the balanced scorecard in a wider governance context that includes the management of risk and environmental and social responsibility. Fully illustrated with examples from many different organizations, this book will help you deliver your strategy better. Phil Jones has helped organizations improve how they manage strategy and performance in the UK, Europe, US and Far East, including organizations in sectors as diverse as Banking, Charities, Manufacturing, Local Government, Utilities, Social Care, Retail, Health, Defence and Professional Services. They have ranged from start-ups to multi-national listed organizations. Phil is a consultant, author and speaker on strategy, performance and behaviour in organisations. He worked for Norton & Kaplan (authors of the original balanced scorecard books) for over four years and now runs his own research based consultancy, Excitant Ltd.